Successful cycling planning depends on combining improvements to infrastructure with education. There are chapters examining both national strategies and local initiatives in cities around the world, including such topics as changes to existing road infrastructure and the integration of cycling with public transport. Since education is a critical element in cycling planning, contributors also consider such topics as developing healthy travel habits in the young and ways of promoting cycling. A number of chapters look at the complex relationship between cars and cycling, discussing how roads can be successfully shared between these two modes of transport. 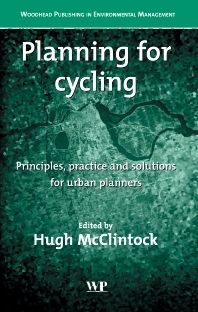 With its blend of practical experience and suggestions for improvement, Planning for cycling is essential reading for urban planners, environmental groups and those researching in this area. The mainstreaming of cycling policy; Development of UK cycling policy; Promoting cycling through ‘soft’ (non-infrastructural) measures; Making space for cyclists – a matter of speed? Homezones and traffic calming: Implications for cyclists; Developing healthy travel habits in the young: Safe routes to school in the UK; The UK National Cycle Network: A millennium project; Cycling with public transport: Combined in partnership, not conflict; Planning for more cycling: The York experience bucks the trend; Planning for cyclists in Edinburgh; Nottingham; An efficient means of transport: Experiences with cycling policy in the Netherlands; German cycling policy experience; Urban cycling in Denmark; Traffic calming on the national road network to improve cycling conditions in small towns in Poland: The case of Kobylnica Slupska on National Road 21; Padua: A decade to become a cycle city; US bicycle planning; Increasing cycling through ‘soft’ measures (TravelSmart) – Perth, Western Australia.